Our ‘Dual Focus PhD’ series tracks the working lives of our part-time PhD fellows. Many work at the highest of levels, both nationally and internationally, including for other parts of the UN system. They come to Maastricht for our unique PhD Dual Career Training Programme in Governance and Policy Analysis (GPAC²). This time Dr. Mindel van de Laar speaks to Dr. Mutinta Hambayi Nseluke, who works at the World Food Programme headquarters in Rome. You defended your PhD thesis ‘A tall order – Improving child linear growth’ on 19 June 2018. When you applied to the programme, you were working as a project manager for the UN’s World Food Programme. Was there a link between your activities at work, and the choice to apply for a part-time PhD? I was reassigned to Malawi, to lead a corporate proof-of-concept pilot project on the prevention of stunting. Lessons from the project were envisioned to inform how the organisation as a whole would contribute to global efforts to reduce stunting using the many programme platforms WFP has, especially in countries where stunting is high. Stunting in children especially below the age of two years has lifelong consequences, on health, schooling and limits the future economic potential for individuals and their societies. The discourse on stunting was becoming central in nutrition, health and development agendas. But it was clear that solutions, were different in different places. I soon realised that to lead such a project, I needed to gain a greater depth of knowledge on the subject, since I was later expected to technically influence change within the organisation. As a middle career professional, the biggest opportunity for me was a part-time PhD programme because I could not leave my job. So, I started looking for universities that would offer a part-time programme. I learnt of Maastricht University through an acquaintance and it was a perfect fit. I had no financial limitations. I applied and was successful the first time. Your study looks into the relationship between maternal education and children’s growth, in particular looking at nutritional intake and local diets. You studied in particular young children (6-59 months) in Malawi. Why did you choose Malawi as your case study? Can you elaborate on your main findings? 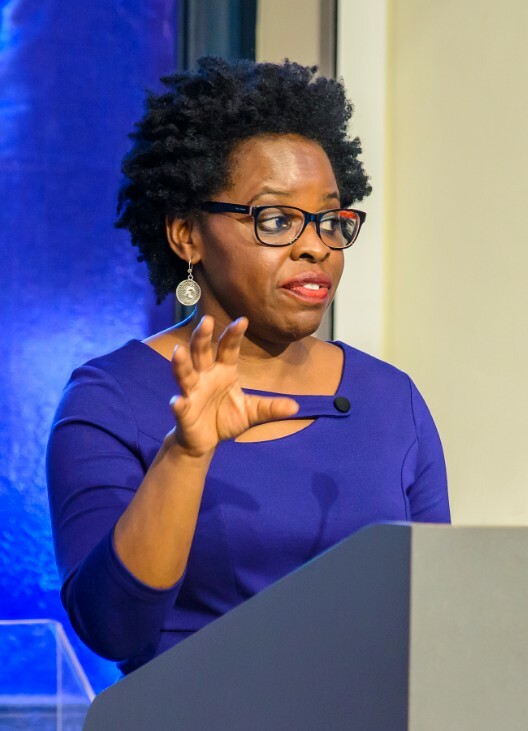 Malawi was an obvious choice, because I was in the country working as a nutritionist and a number of questions began to emerge on how best to address stunting and what the determinants might be in this context. I was particularly interested in what foods from the local diet might be part of the solution and the importance of girls’ education – because more than half the mothers in the project were teenagers and out of school. As a case study, Malawi was ideal for many reasons. The country has a i) high child stunting burden at 37%; ii) has had an education reform policy since 1994 favouring girls, thus providing a natural experiment for studying the causal impact of the increased education of exposed mothers on stunting outcomes of their offspring; iii) has rich waves of nationwide datasets; and iv) a strong political will to end stunting. Using quantitative analysis techniques, my findings reveal a broad range of stunting causes encompassing child, maternal and household socioeconomic factors. Risk factors are being less than two years old, having a history of child illness, being a female child and household asset poverty. Protective factors are maternal education, nutrition programmes, and a diverse diet. 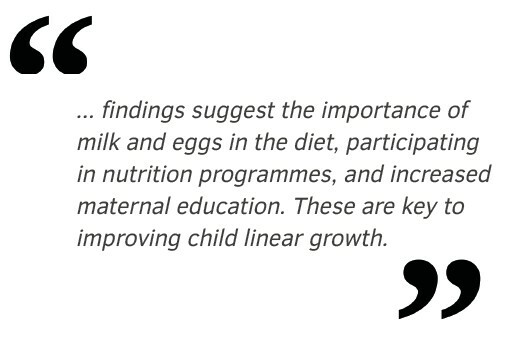 Regarding diet, milk and eggs, given 2-3 times a week in modest quantities of about 11-25g showed the most potential for improving child linear growth. Animal Source Foods (ASF) remain important and results show that benefits may differ according to age, ASF type and wealth status. Scrutinising the causal effect of increased maternal education on stunting was most revealing. A one-year increase in maternal schooling reduces stunting by 7% at population level. In the study, increased levels of girls’ schooling was advantageous in terms of own birth timing (minimised teenage motherhood), utilising health services for themselves and their children, animal source dietary choices, and reduced stunting in their future offspring. Exposed mothers were also likely to have a child with an educated father and less likely to work in agricultural labour. Therefore, increasing girls’ education is an effective strategy for having taller children in the next generation and reduces stunting in the short and longer term. Taken together, as part of the stunting solutions, findings suggest the importance of milk and eggs in the diet, participating in nutrition programmes, and increased maternal education. These are key to improving child linear growth. Linkages in education, health and agriculture are necessary as a comprehensive approach to address the persisting levels of stunting in Malawi. During the course of your PhD, you raised your children, changed jobs and with that moved from Malawi to Rome (Italy). Currently you are working as chief nutritionist for the UN WFP HQ in Rome. And in the meantime you managed to complete your PhD studies. What is your best advice to working professionals aiming to do the same thing? My first advice is that doing a PhD while working is possible but it tests your endurance. Tip #1: you should pursue a PhD if you are really interested in it, not if you can’t think of something else to fill up your time. Tip #2: Quitting was not an option for me and how I juggled anything else, children and work, rested on my commitment to complete the PhD. A former fellow, Dr Joe Abah, told us in 2013 that a part-time PhD requires you to spend three hours of your time every day. I took him seriously. Tip #3: I invested three hours every single day, no matter where I was. Sometimes it was hard. Mostly evenings, after the kids’ bedtime from 8 pm. Weekends were a bonus for longer hours. Tip #4: I did not compromise on sleep, I needed to stay fresh at my day job. Tip #5: Choose a topic you are passionate about or familiar with because the research path evolves and you can easily adjust. On relocating, fortunately, my children always look forward to the adventure of the next country. Now that it is over, the inner fulfilment of being at the very educational top of my field is amazing!